text for your postThis is our final REAL wall for a while as Elena and I are going travelling. We've given up our jobs, sold everything we own and have put your postcards in storage. I've taken the address down for contributions to my REAL wall and want to thank everyone who's contributed over the years for all your excellent post. So, with no fixed address, no income and a postcard and blogging habit to sustain, what's next? I've set up our new travelling and postcard blog at www.postcardsfrom.us and will be selling postcards from us from wherever we go in the world! 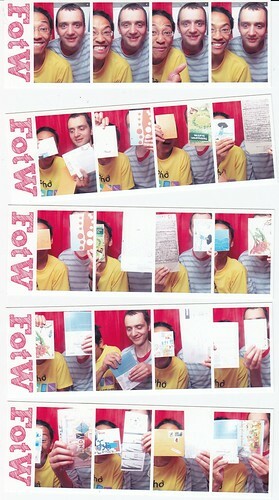 Get yourself over there and pick up a postcard from wherever in the world we are now! This is our final REAL wall for a while as Elena and I are going travelling. We've given up our jobs, sold everything we own and have put your postcards in storage. I've taken the address down for contributions to my REAL wall and want to thank everyone who's contributed over the years for all your excellent post. I met an old university friend this weekend who I haven't seen for a few years and we went out to the South Bank to catch up on old times. They have a really cool little machine there, like a retro 4 photograph passport photo machine, but inside it's got a digital camera and it prints the 4 photos really quickly. Anyway, they have this machine and a wall with plastic photo pockets, where people would put their photos after they were taken. The machine is free to use and the wall is rammed with photos, it's great. I realised that we could make an artwork within an artwork with this, so me and Dave grabbed your post and sat in the machine passing post to each other to make this one - it was great fun! "p.s. This ning platform is interconnected with Twitter. When you have an account you can send your postings straight to Twitter as a tweet." "Am on twitter @iuoma , but somehow it doesn't brng me that much new ideas since I work on that many platforms already." 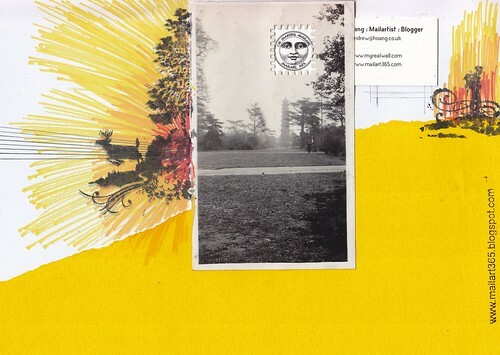 "March 10 is International Bagpipe Day https://m.youtube.com/watch?v=oO1bGlyHDNU"
"Hello, my blog contains more then mail art work. Under this label you can find my letters and postacrds i made: http://trimaliny.blogspot.com/search/label/mail-art Not too much to see yet, but i am working on it :)"
"Started late, but moving right along. Love the challenge! I’m thinking of glueing macaroni (in a tasteful design) to a business reply envelope. Stay tuned! " "Carolyn Cline Cline Home for the Bewildered Colorado Springs CO 80903-2922 USA"
"Exciting to see new people taking on the MAILART365 challenge! I learned so much and grew artistically from doing it,"
"Ha! Yeah tell me about it. It was one of those software updates where you couldn't actually decline it too. Grrr"
"Don't you just love progress? Thank you!" "Hi Carolyn I've seen the one you mean and managed to rotate it. It's quite a fiddly process unfortunately and I'm not sure how to explain it. I went into the "media" bit and edited the file then had to delete it from…"
"How do you rotate a picture on the website?" "Carolyn & Rod’s Anniversary October 1"
"I will love to get together one sunny day, not yet though. let's wait for better weather. " 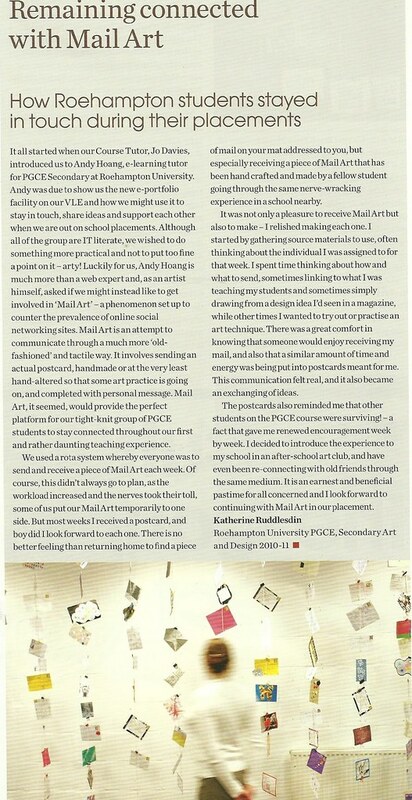 When I found out about the mail-art movement I realised that the wall, which itself is my work of art, was perfectly suited for incorporating other peoples art and decided that I would get involved in this community. 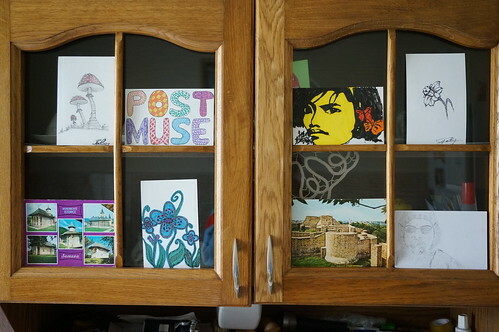 I am working on my own mail-art as well as actively involved in displaying any that I receive and I endeavour to write back to anyone who sends me anything. Postcard or digital art competition open to all - £30 Amazon vouchers up for grabs! Hi all - thought this would be a welcome distraction and a chance to make some art and perhaps get involved in a creative conference in London. We're running a conference in London for creatives involved in wellbeing, which includes you! This competition is open to all. Little Big Stories - Graphic Narrative on a small scale"
Wow! So good to see you two, and the baby! Wowee!!! The fish mailart came last week. So beautiful I squealed aloud in the post office!! Sorry I can't scan it at the moment I will when I can but I'm off to India on Saturday. Thanks to you, I know that I can make mailart whilst traveling ;) Be on the lookout! Greetings to You and Elena! Beautiful card! and thank you for the wood "365"! Vuoi far parte del mio gruppo " performances" ?